Or The Hunt for Kenny Stabler and a Great Book. Those were part of the directions I had written down from Mary Seiley to visit her and her husband John in their historic home in Bay St. Louis, Miss., years before Katrina. I had been through the Mississippi Gulf Coast decades before for a job interview in Tallahassee and U.S. 90 trip from there, all along the “Red Neck Riviera” to New Orleans. One reason I stuck to 90 over I-10, not yet completed, and drove rather than flew, was the off-chance at a stop in a bar in Alabama there would be Kenny Stabler, the Snake, the left-hander with the golden touch for the Raiders. I stopped at least twice, but I never saw him. The drive became my first experience with the Gulf of Mexico, the wide beaches, the sun, the smell not only of salt but petrochemical plants and paper mills. And there would be plenty more trips to the Gulf — my first wife lived in Corpus Christi for years before we were married. She introduced me to the Texas Gulf Coast, South Padre Island, and Aransas Pass. Those waters — to include the rivers, from gargantuan like the Mississippi to the Big Cypress Swamp and that land truly is another world. 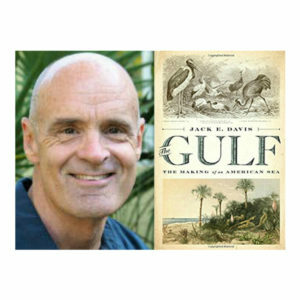 Before the Pulitzer committees made their selections and the announcements became public I had started Jack Davis’ “Gulf: The Making of an American Sea.” It is a non-fiction epic, filled with a sense of place and humanity often at war with itself. Each chapter is sculpted so tightly they can be read individually in a single sitting. Then pick it up and start again the next day, new chapter. Here are the Indians, this is the way this bay was formed, what happened when the New England fishermen arrived, tarpon off Florida versus tarpon off Texas, Greeks and sponges, rising tides, dead zones, miles of rigs laying in the Atchafalaya in Terrebonne [Good Earth, washing away] Parish waiting to be towed out for work, and, not to be ignored by fish, fowl and man — the ‘canes , etc. Of course, Davis, a professor at the University of Florida, won the Pulitzer for history this year. As an end note, he also wrote “Everglades Providence,” the central character of that wonderful work being Marjory Stoneman Douglas, whose name was on the Parkland High School where fourteen students and three staff members were gunned down this spring.